Lindsey Olsen joined De St. Germain Law Office, LLC ("DSG") as an associate in July 2016. She graduated from Louisiana State University with a Bachelor of Arts in Sociology with a concentration in Criminology. While at LSU, she was active with her sorority, Zeta Tau Alpha, and was elected President of Phi Alpha Delta Pre-Law Fraternity. Lindsey earned her Juris Doctor from Loyola University New Orleans College of Law in May 2014. During law school, Lindsey held a judicial internship with a 22nd Judicial District Family Court Judge where she discovered her passion for Family Law. 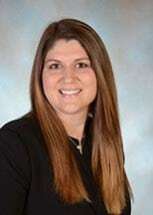 She also assisted with the review and improvement of the Jefferson Parish Ethics code and worked with the St. Tammany Parish District Attorney's Office. Lindsey continued to be active in Phi Alpha Delta Law Fraternity while at Loyola by serving as Vice-President and Treasurer. She began serving her community by providing legal representation to indigent clients while a student practitioner in the Family Law section of the Stuart H. Smith Law Clinic and Center for Social Justice. She has continued this practice by providing pro bono legal services to St. Tammany Parish citizens through the Northshore Pro Bono Project. Prior to joining DSG, Lindsey worked in law office focusing primarily on family law, criminal law, and personal injury. Lindsey is admitted to practice in Louisiana and is a member of the Louisiana State Bar Association and the 22nd Judicial District Bar Association. In her spare time, she enjoys reading, spending time with her family and cheering for the LSU Tigers and New Orleans Saints.